A relatively easy, fun way to refresh your kitchen is to update the backsplash. Natural stone is becoming increasingly popular as a backsplash. Whether in an affordable tile pattern or easy-to-clean slab, natural stones such as granite, marble and slate complement any kitchen. Yes, you read it correctly. Chalkboard backsplashes allow you to leave messages, create a menu and much more. They are practical, yet fun and affordable. Available in a variety of options, glass backsplashes are durable, as well as the most hygienic options of backsplashes. You can choose practically any pattern, color and installation design or simply go with full slabs of glass for a clean, modern, minimalist look. Textured, 3-D and contemporary, pebble tiles are not just affordable, they’re eclectic. A great way to jazz up an otherwise boring kitchen, pebble tiles have a more rustic appeal and are easy to install. Keep in mind: they can be difficult to clean but will make up for it with their appeal. For a fresh new look, try a wood backsplash. Extremely interesting as a backsplash, wood has the added benefit of being easy to install and can be painted any color to complement your kitchen. 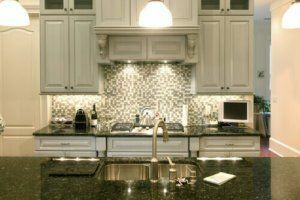 Do you need help installing a backsplash in your kitchen? Contact Republic West Remodeling today for help with backsplashes or any other kitchen remodeling in Scottsdale.